This is one of those few, precious books that consider walking without stumbling clumsily all over the territory. Rather than passing judgement, for entertainment or sectarian reasons, on everyone else’s walking, Chejfec illuminates ours by judging his own. He is brutal, flirting with melancholy, but survives its crisis. My Two Worlds hangs around a single walk, a wander to a park in an unfamiliar southern Brazilian city. On his way, and then from a few points of vantage, Chefjec describes his walking to himself. What makes this book so fascinating, so engrossing and so useful, is where the author places himself on the walking continuum – halfway between flâneur and dériviste (although he would never articulate it in such a crude way, facing off just such a crisis of opposites before the end). This in-betweeness plunges Chejfec into many dead ends; his is an emotional-geographical ‘progress’ that will thrill with recognition anyone who walks, questioningly, uncertain, exploring their own walking as well as the streets they walk through. 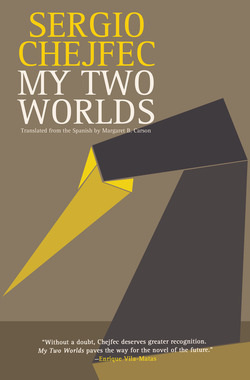 In gentle, meandering prose (which is itself, a test) My Two Worlds takes out and ponders the toolkits of wandering: maps, encounters with strangers, negotiations, paranoia, heightened senses, morphing landscapes. In the park, a few palm trees in a car park become a jungle, passing a dozing man he encounters a doppelganger moving across time. A swan-shaped pedal boat is a magic animal, shamanic, clawing his imagination, the perverse messenger of natural things. But never does this book give in to fantasy or occultism, it recognises the tendency of geometry and its short cuts to metaphysics. Most of all it articulates the sensibilities of the wanderer, imagining himself as a cartoon character, “compenetrating” the atmospheres of the street. For anyone who walks, this is a literary wanderer worth joining for a hundred pages.